The Neptunia franchise never ceases to amaze me. I mean, it’s literally a series that takes video game consoles and companies, transforms them into anime girls, and throws them into a number of crazy, often times non sequitur, adventures featuring plots which subside on little more than fan service, immersion-breaking jokes, and puns. It’s one of the most ridiculous concepts that I’ve ever seen. And, honestly, I never would have expected it to become as successful as it is now. But hey, that’s not anything to complain about. 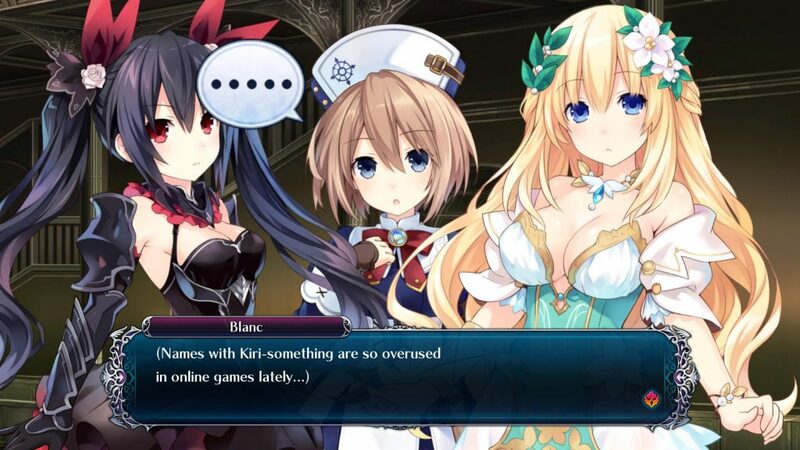 After all, it’s only because of that success that we’ve gotten great games like Cyberdimension Neptunia: 4 Goddesses Online (for the second time, too)! And that, as I’m sure we can all agree upon, is definitely a good thing. Yes, yes. We know, don’t worry. 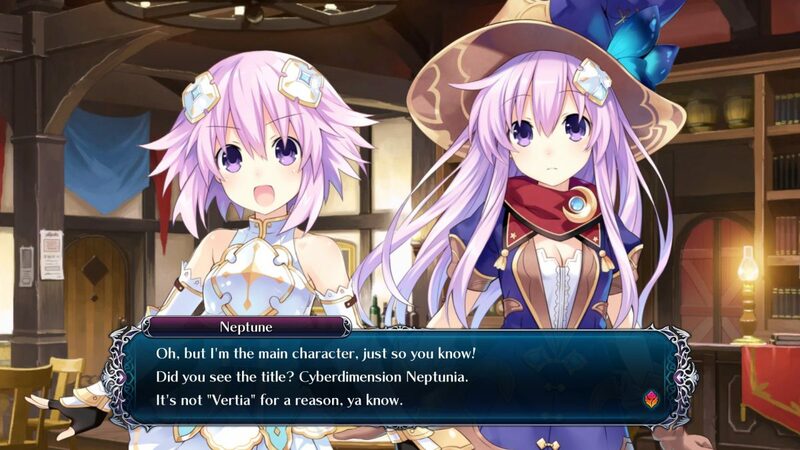 The Neptunia franchise is no stranger to its own metanarrative, but Cyberdimension Neptunia takes things to new heights. The game begins with Neptune and the rest of the CPUs logging into the brand-new MMORPG “4 Goddesses Online” (which I’ll refer to as “4GO” from now on) as Beta testers. Upon arrival at 4GO’s digital world of Alsgard, Nep & co. are informed by an NPC named Bouqet that the second coming of the Demon King is approaching, and that they, as the chosen heroes, must stop this at all costs. 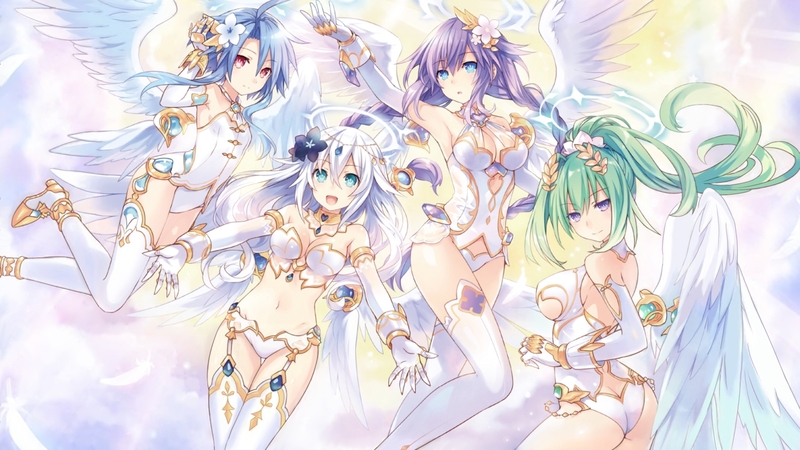 In order to do this, they must collect the four Sacred Treasures which, in turn, will summon Alsgard’s Goddesses… who happen to be based on the CPUs themselves. And things only go from strange to stranger when a series of events forces Nep and the gang to fight not only for Alsgard, but for the survival of 4GO itself. One of the most impressive things about Cyberdimension Neptunia‘s story — and really, the stories in all the Neptunia games — is how it handles tropes. This isn’t just a game about tropes, this is a game that is a trope. It essentially does nothing but borrow from and poke fun at elements from popular video games and anime. Heck, it’s probably even poking fun at its own fan base. Normally, that would be a recipe for disaster. But Cyberdimension Neptunia turns it into a work of art. And that’s because the game doesn’t laugh at the player with its jokes, but with them. This comment is only the tip of the referential iceberg. Despite its tropey-ness, most of the game’s (numerous) jokes are surprisingly clever. They’re the kinds of things that you wouldn’t really laugh at — or even understand — unless you were a part of the fan base of whatever’s being referenced. In that way, it almost feels like it’s rewarding you for being a total nerd — which you probably are, if you’re playing this game (and I mean that in the best way possible) — and the nerdier you are, the funnier you’ll find this game’s writing. I don’t think that people give humor enough credit sometimes. Mindless laughs are great and all, but it takes work to come up with clever references and jokes. And if there’s one thing that Cyberdimension Neptunia has, it’s clever references and jokes. Well, that and waifus. The motion blur makes you FASTER. Falling in-line with past Neptunia games, most of your time in Cyberdimension Neptunia will be spent dungeon crawling. And, although I’ve enjoyed delving through numerous dungeons in this franchise before, this game boasts some of the best dungeons by far. 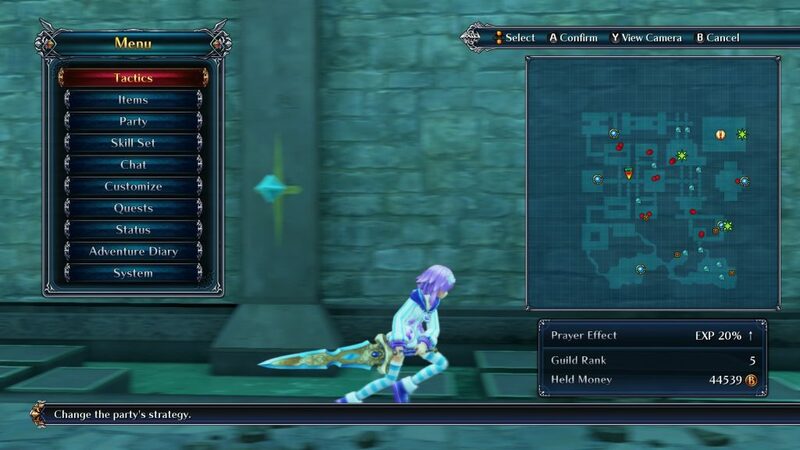 Though relatively small in number, each available dungeon is rather sizable (for a Neptunia game, anyway), giving them decent replay value (which is good, because you’ll be visiting them all several times). Additionally, the game goes out of its way to place treasure chest, gathering points, and, sometimes, even rare monsters in out-of-the-way places, making sure to put as much available space within each dungeon to good use as it can. There’s also Wishuel, the game’s hub world. 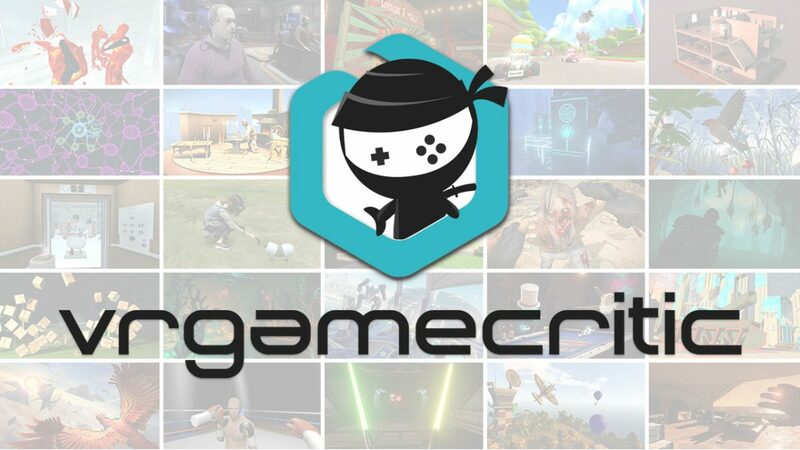 Like most other Neptunia hub worlds, Wishuel is your one-stop shop for literally everything that doesn’t involve dungeon crawling, containing everything from shops to storyline events. Scattered throughout Wishuel are also a number of viewable sub-events. Although you can net a few items through some of them, most sub-events are merely there to help expand the story. Free loot or not, though, they’re really entertaining, and I wouldn’t recommend skipping them. And, if good writing isn’t enough to draw you in, there may or may not be a few unlockable CG images for you to, um, “appreciate”. From mechs to mandragoras, this game has plenty of baddies in need of a beatdown. 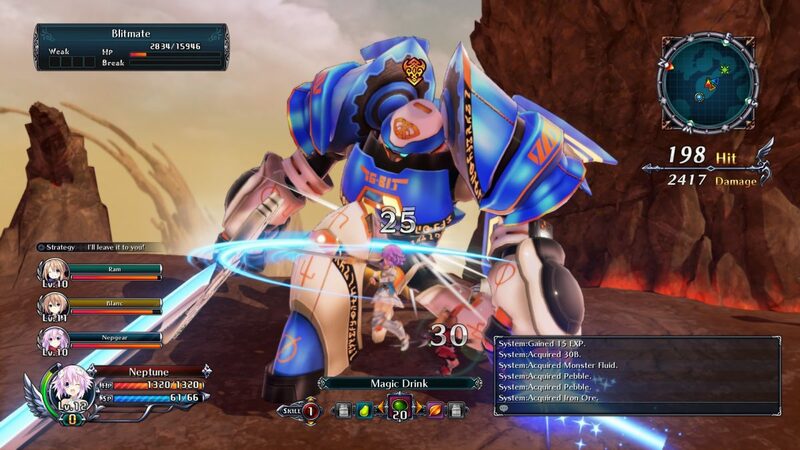 Cyberdimension Neptunia is the first of its kind in terms of combat. 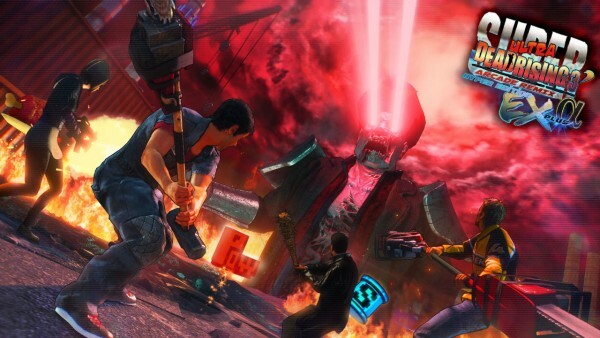 Abandoning the series’ traditional turn-based combat, this faux-MMO instead takes place as a fully-fledged action RPG. Although new to the series itself, gameplay mechanics aren’t exactly anything novel. Combat adopts a hack-and-slash approach, which basically translates into you mashing the attack button a good 80% of the time, with the occasional special attack thrown in for good measure. Your opponents won’t just stand there while you’re whittling away their HP, however. They fight back! Guarding — more specifically perfect guarding — becomes increasingly important the further along you go. Perfect guards negate damage, auto-counter, and restore SP, making them an important skill to get down. Admittedly, combat isn’t very challenging. But it is enjoyable. There’s just something about mowing down swarms of enemies while constantly leveling up that feels so rewarding — and this game works that angle incredibly well. Neptune may be the series protagonist, but (and don’t tell her that I said this) you don’t actually have to play as her. Cyberdimension Neptunia features eight playable characters each with their own distinct class (and later on, four additional character who each share the same class), ranging anywhere from front-liners like Black Knight Noire, to back-line brawlers like Mage Nepgear, with a few support classes thrown in for good measure. 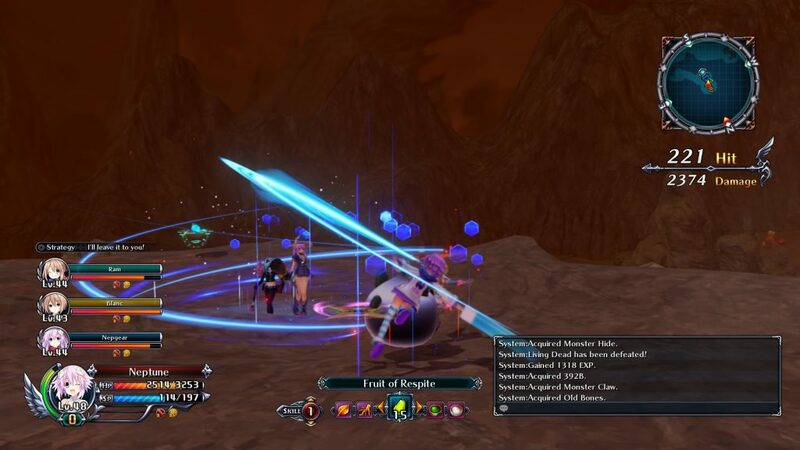 In addition to choosing your own character, players can also form parties with up to three other characters. Despite each sporting a unique class, the game does nicely with character skill versatility overall, meaning that those of you really intent on selecting your party based on favorite characters alone can probably get away with it. A slime made of metal is sure to raise your level! As fun as combat is, I do have a slight issue with how EXP is handled. The members actively participating in your party gain the most EXP. That only makes sense. But how much EXP do non-active party members gain? Absolutely none. Now, I’ll cut the game some slack here. Given that combat isn’t overly complicated, mixing things up isn’t necessary. So long as your party is decently balanced from the beginning, you’re fine. But, if you ever do find yourself needing (or wanting) to swap out party members, then you’re out of luck. Unless you’re willing to go back and grind levels, you’re pretty much stuck with what you got. And, given that the game gives you four new party members toward the end, this can get frustrating. Still, leveling isn’t overly difficult. So those of you committed to maxing out every last character shouldn’t have too much trouble. As Good as the Real Thing! Even after playing through (and reviewing!) it for a second time, this game still holds up very well. Taking all of the Neptunia charm that you’ve come to know and love, and putting a fresh, new hack-and-slash twist on it, Cyberdimension Neptunia: 4 Goddesses Online definitely isn’t a game that Nep-heads will want to miss. You can trust me on that! 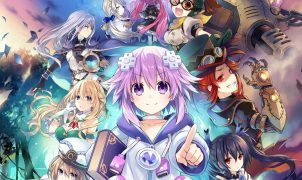 Full disclosure: This review is based on a copy of Cyberdimension Neptunia: 4 Goddesses Online given to Hey Poor Player by the publisher.